We live in the area of the UK where the fascists are at their strongest, and so our task is far harder than other areas, especially given wider political issues which make progressive left wing politics in the North East even harder ie, bureaucratic and institutionalised labour movements and authoritarian left politics. Nationally, the year started off very badly for Tommy Robinson who was sent down for using a false passport to get into the USA – Tommy the Illegal Immigrant! Tommy Robinson later abandoned the failing EDL having been shocked to discover they’re a bunch of racist nazis – who’d have thought it!? We have had quite a year as well. Our regular activity in Sunderland opposing the NPF and NEI was supplemented by a trip to oppose the EDL in Manchester where they managed to gather about 400. The trip was useful for us as a good-sized black bloc managed to lead the march off towards the EDL, breaking through several police lines before being forced back onto the “official” demo. It demonstrated that militant anti-fascists are starting to assert themselves. Then came the “Rigby effect”, which boosted the far right. The 25th May national EDL event in Newcastle briefly transformed them from small fry into something larger because of this, and had the effect of catapulting NEAF to a national and even international audience – over 30000 were looking at our Facebook page alone then. 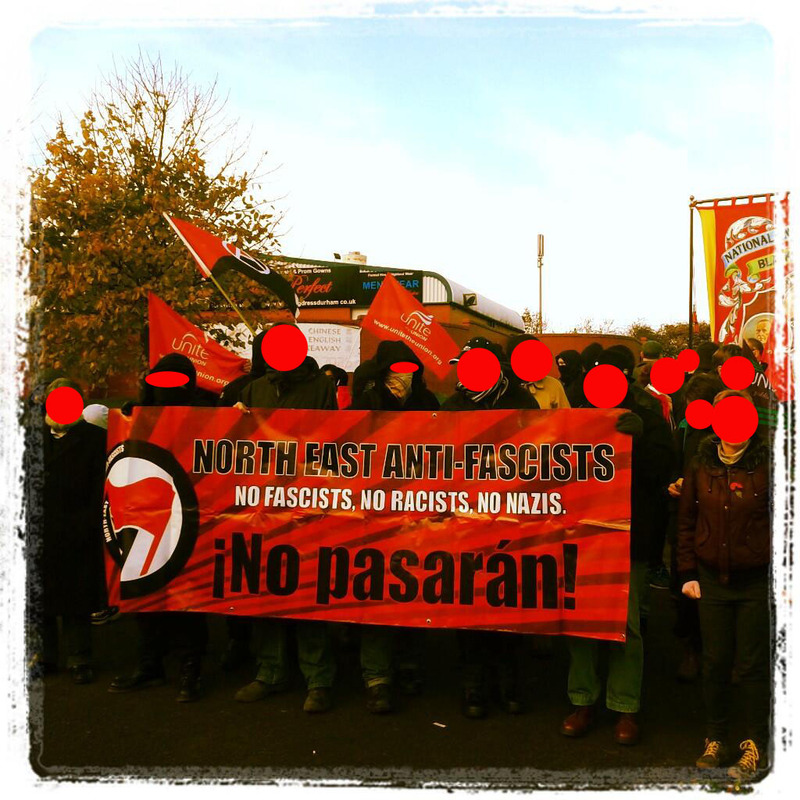 North East Anti Fascists did well on the day given the numbers we had, though the anti-fascists were outnumbered by a national mobilisation, a warm Bank Holiday and the backlash from Rigby’s murder. The timing could hardly have been more fortuitous for them. In the North East the Labour movement and the left have totally forgotten how to do politics unfortunately, sometimes deliberately so, and a lot of people are looking to us for a lead. Then our next mobilisation was to Birmingham on July 20th where a lot of pissed EDL were fighting the police, and UAF again contrived to have the anti-fascists kettled well out of sight. The police had locked down central Birmingham very effectively. The redundancy of liberal anti-fascism by this point was painful to see, with angry kids trying to break out of the kettle to get at the fash and disco-dancing divvies coming close to getting a slap for throwing around accusations of “police provocateurs”. However, we were making good links by this stage, and extending what we were able to do, meeting up with Yorkshire groups amongst other things. The next local event was in South Shields during the August Bank holiday weekend, where we confronted 280 EDL and assorted others – Scottish Defence League, NWI and other Infidels. One of them tried to attack anti-fascists but got repelled successfully and then arrested, and in the main the police had things totally under wraps again, with some oppressive policing, with arrests and a strange alcohol banning order being used against a totally sober anti-fascist. After Shields, the EDL/Infidels returned to Shotton on November 9th, in the hope of having free rein for another piss up, first it was on, then off, then the infidels said they would do it and in the end the fascists/EDL/Infidels chaotically did it, with the prominent organiser a well known, to the police, football hooligan wannabe (nowhere near a ‘top boy’) and a self confessed fan of the beast Fred West. FFS. However, working with the Durham Miners Association, NEAF leafleted the town, helped mobilise opposition and ensured that all the local pubs refused them entry. Later that month, it was a similar story in Hartlepool on November 30th, where NEAF went leafleting twice, and mobilised a “Ban the Burks” protest in opposition to the Neo Nazi North East Infidels’ “Ban the Burka” demo. The fash had promised something special in Hartlepool, but delivered their weakest regional demo to date: a mere 85 on their dirge of a march, with the others barely bothering to leave the pubs. Meanwhile a small NEAF contingent occupied their rally spot on the cenotaph, disrupting their march until cleared by the police. The end the year saw over 30 EDL getting sent down for over 60 years for the riot at Walsall, with a couple of North Eastern fascist convictions. The fascists had filmed it and then put it on Youtube – which basically provided the filth with even better evidence than their own. The stupid fekkers. The London Anti-Fascists see this as blatant political policing and we can only agree, but so what? This is what is involved with those who want to contest politics on the street. We were happy that this time fascists got banged up. This was the law basically warning the EDL that it is over and that if they want to kick off again they can expect prison. Of course, this also will be applied to militant anti-fascists as we know from the 286 arrests in Whitechapel, 60 arrests in Parliament Square etc. However, we leave 2013 with the EDL effectively over nationally, BUT not in the North East, with the NF,Infidels, NPF, BNP, EDL, EVF, UKIP etc all prancing around talking to each other. Anti-fascists nationally can see this as a good year with several successful mass mobilisations and a bit of hand-to-hand on the Brighton seafront. The North East Anti Fascists have made more friends, has continued to learn and develop tactically, and have been more effective as a result. Though the situation is not as positive in the North East overall – this being last remaining fascist ‘stronghold’ – there’s reasons for optimism. Hopefully, we can make next year their last! Happy holidays to all our friends new and old, and see you in the New Year! We have much work to do. NAZI SCUM, OFF OUR STREETS!